← So what just happened? Somewhere, and I can’t exactly pin down either where or when, EuropeanCuisineLady (in real life, American-Irish SF writer Diane Duane, co-proprietor of European Cuisines with her husband Peter Morwood) posted something about how it was getting to be the time of year for baking fruitcakes, and oh by the way, here are some recipes. I saw one of them that piqued my interest, a Scottish fruitcake called “Black Bun“, which (despite being Scottish) isn’t soaked in whisky for six months, and unusually, is baked and matured inside a pastry case. I had never made a fruitcake before, and figured this one looked interesting enough to try. 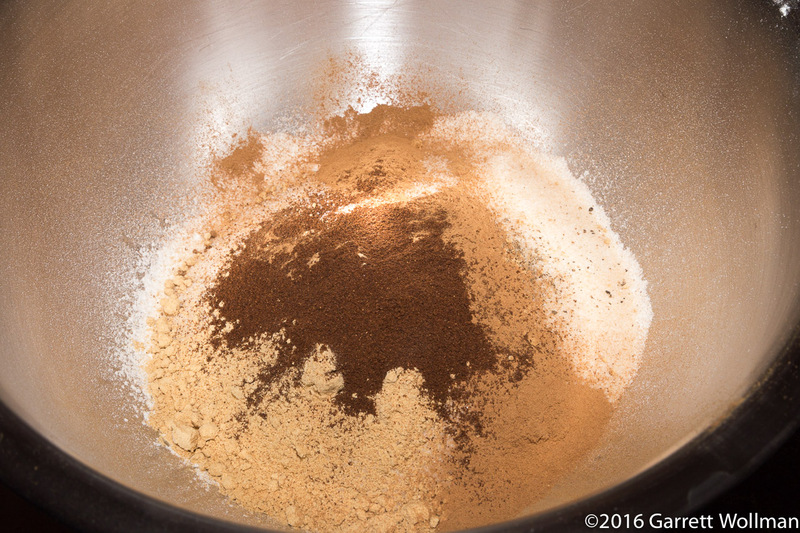 One drawback to this recipe: the original recipe calls for a few ingredients that are not readily available. Thankfully, Duane has given appropriate substitute ingredients for them. (There’s also one bug in the recipe, which I’ll get to later.) 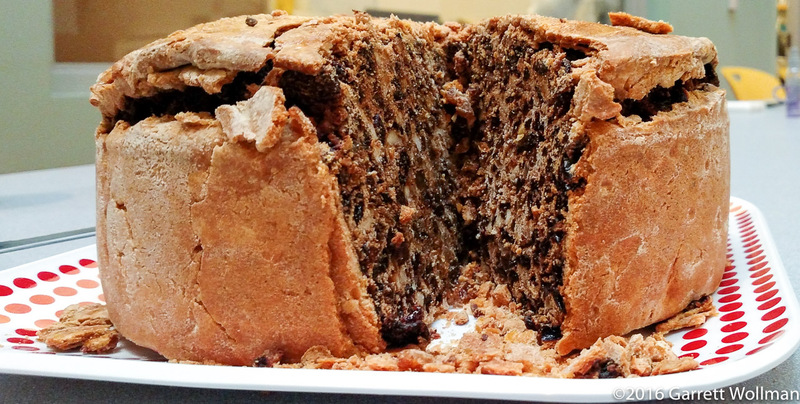 This fruitcake is exceedingly large, and also very dense and difficult to slice, but most of the people in my office who tried it quite liked the combination of dried fruits and spices. Only one person complained that it was too dry. As mentioned, this fruitcake is baked in a pastry case, so the first step in preparation is to make the pastry. I did this a day ahead of time (which is usually a good idea when it comes to pastry), but didn’t take any pictures of the preparation. The recipe calls for just a single egg, but I ended up using three, as it was just too dry otherwise. (Perhaps this was unnecessary; I’ve not made this particular style of pastry, which has a very low butter-to-flour ratio, before.) 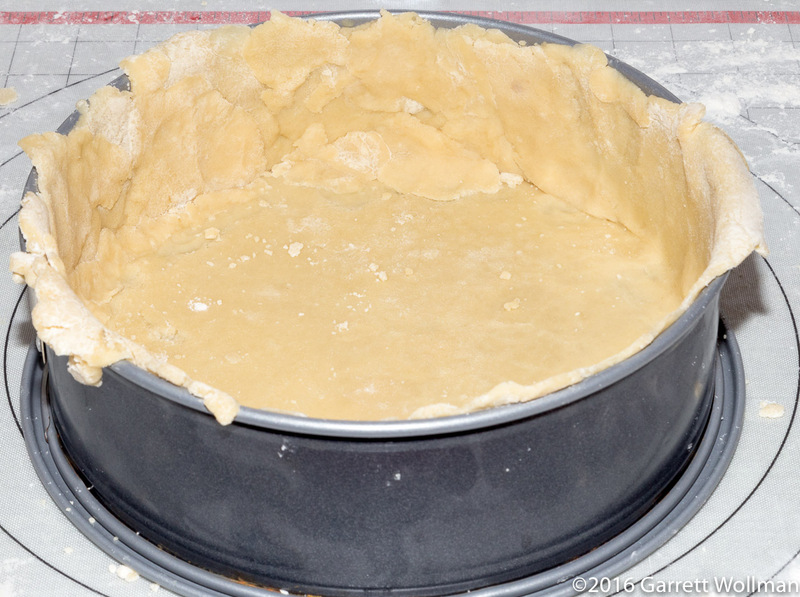 So we start with the process of rolling out the pastry and lining the pan — Duane recommends using a nine-inch (actually 24 cm if it’s anything like mine, and still a bit too small at that) springform pan. 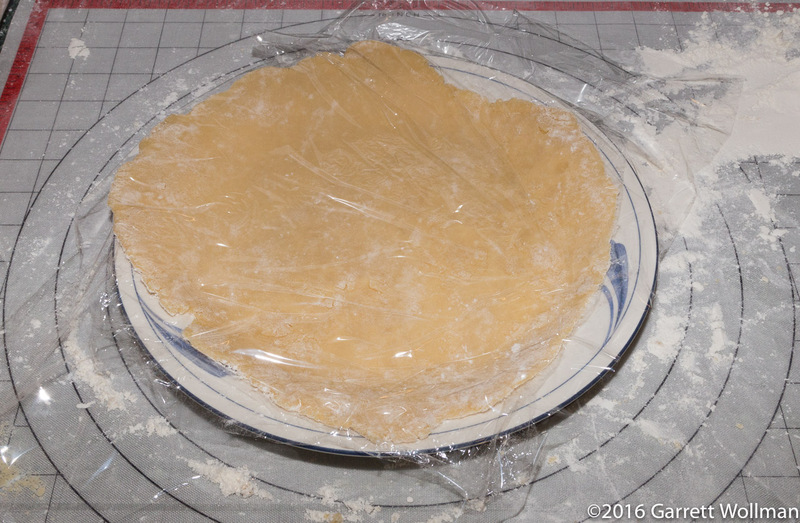 I divided the pastry dough by mass into a top (one third) and bottom (two thirds) and rolled out the top first. The way this is supposed to come together (which as you’ll see didn’t quite work out) the edges of the bottom are supposed to get folded over and sealed to the top, so I made my top approximately the same diameter as the pan itself. I then put the top into the fridge to relax. 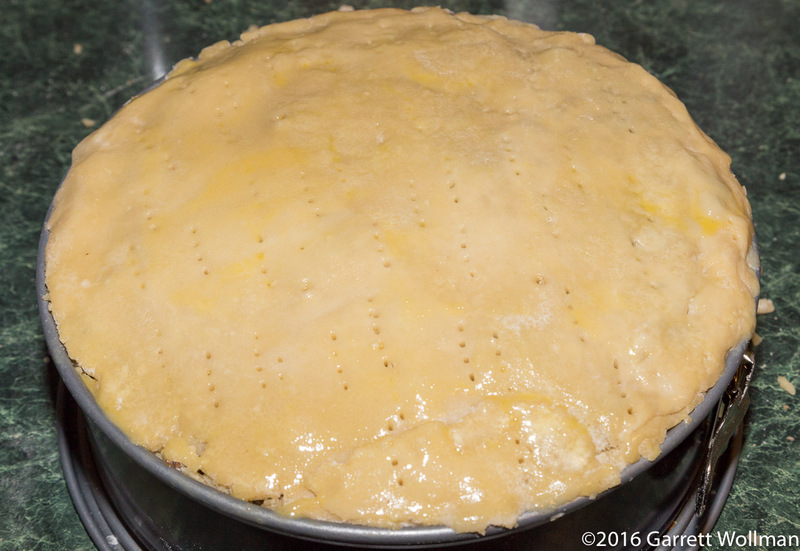 So it turned out that the 2:1 ratio was not actually right for this crust: it’s what I would use for a pie or a tart, but the taller sides of a springform pan need more pastry, and to get enough coverage I made the dough so thin it was nearly impossible to transfer. (I could probably have fixed that by refrigerating it for 15 minutes or so, to let the fat firm back up some, but it would have helped to have some actual measurements to target.) 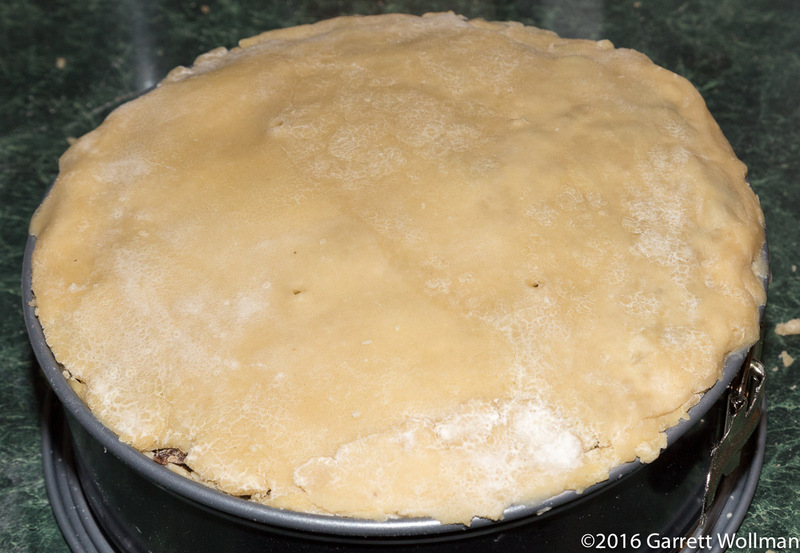 As you can see in this view, even with a very thin pastry, there still wasn’t quite enough to leave the necessary overhang for sealing around the top crust. The results of this will be more obvious after filling, but in the mean time, I stuck the lined springform into the fridge for safekeeping. So now we move on to the actual “meat” of this fruitcake. The cake clocks in at something over six pounds, of which four pounds are raisins (in the two brown bags, half golden and half Thompson seedless). I created my own “mixed candied fruit peel” by combining two ounces each of candied lemon, orange, and citron, shown here in the original packaging. I also had to buy blackstrap molasses, since all I had was regular molasses; all the other ingredients were things I regularly had on hand. This fruitcake is quite spicy, including significant quantities of black pepper, allspice, ginger, and “cinnamon or cloves” (I used a mixture of true cinnamon and cloves). There’s only a tablespoon of brandy in this recipe, far less than I would have expected. 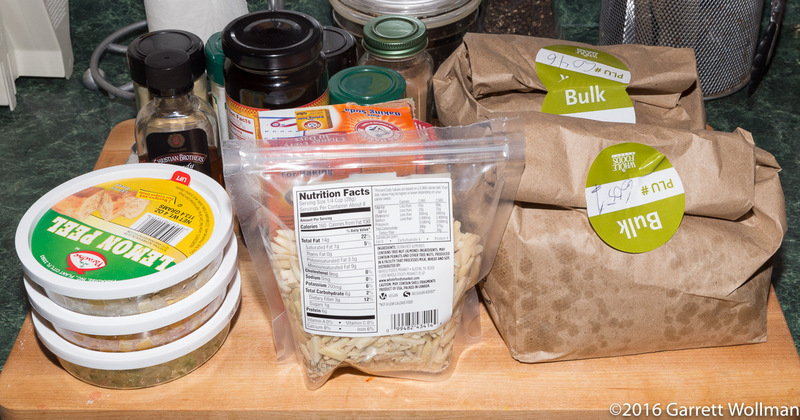 Not shown in this photo: a pound of flour, six ounces of granulated sugar, and an unspecified quantity of beaten egg — I ended up using four eggs. 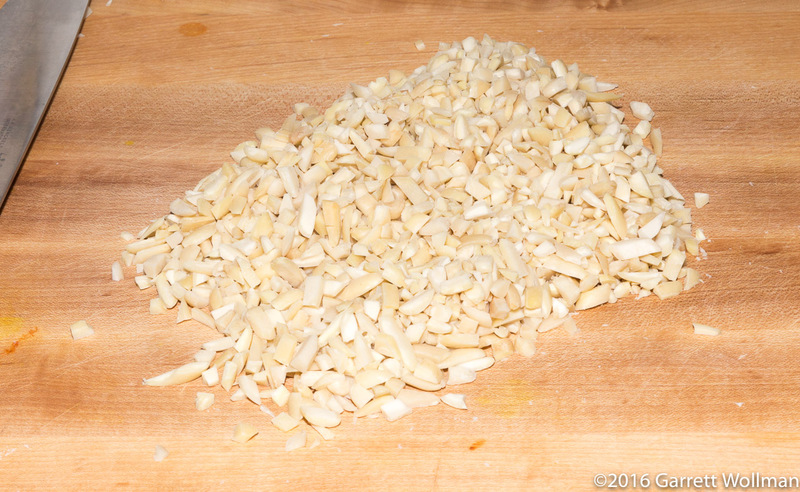 The recipe calls for chopping the six ounces of almonds; although I started with slivered almonds, I used my chef’s knife to break them up into somewhat smaller pieces. 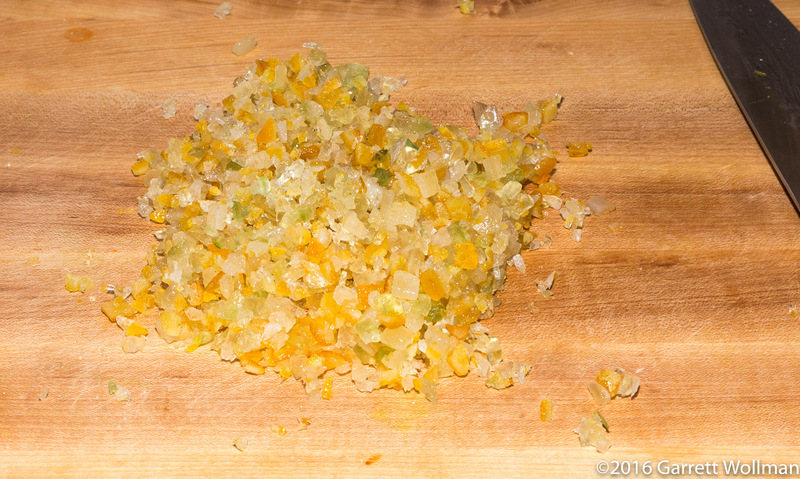 The recipe also calls for chopping the candied peel finely, which isn’t how it usually comes; rather than gunk up the food processor, I did this with my knife as well. 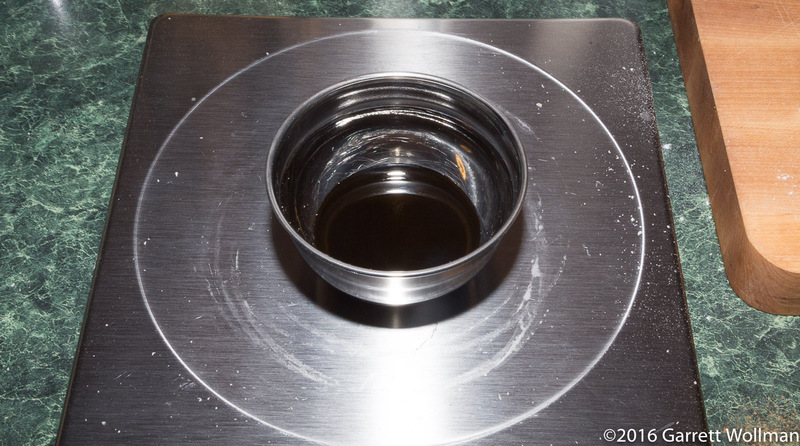 So here’s the bug in the recipe: it calls for two tablespoons of blackstrap molasses (or black treacle, for those who can get it), but the procedure never says what to do with it! I finally decided that what made the most sense would be to mix the tablespoon of brandy with the molasses, thereby thinning it to a more manageable consistency, and add it to the dry ingredients when the recipe says to add the brandy and beaten egg(s). The eggs they have in Scotland must be absolutely enormous, because it really did take me four eggs, and about half an hour of mixing (some with a spatula but mostly with my clean hands) to get it to the point where the fruitcake could be considered “moistened”. 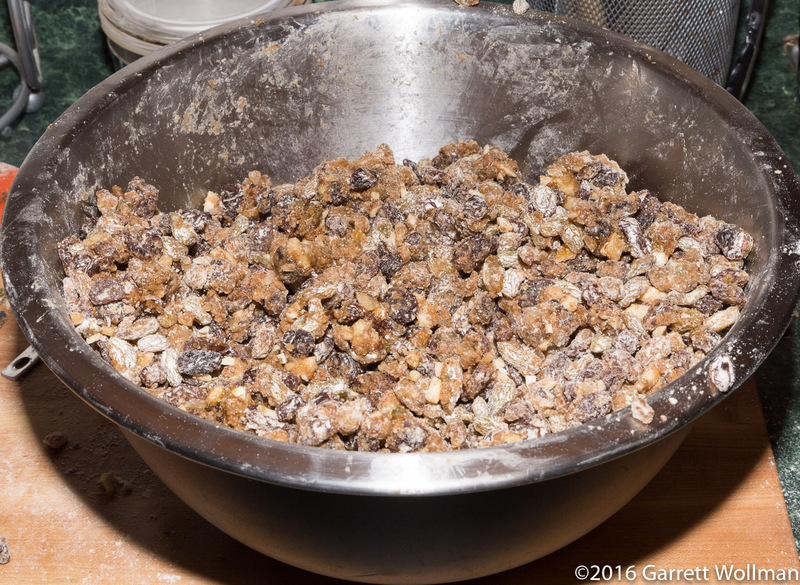 It takes a lot of liquid to moisten a pound of flour and four pounds of dried fruit. Have I mentioned that this is a really enormous quantity of fruitcake? 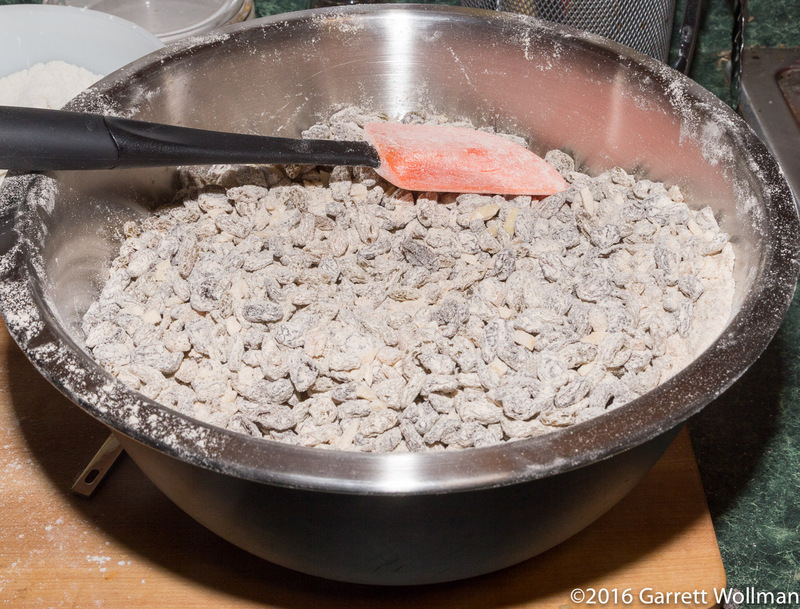 I pushed and pushed and packed the mixture in as hard as I could without bending the springform pan, and still had about half a pound of the stuff left over. You can see here that it’s not going to be possible to really seal the top properly — there’s just not enough overhang. The top crust was almost exactly the right size (I should have hoped so, anyway, since I used the springform ring to size it when rolling); it was just the bottom/side crust that was too small. You can see a few holes here and there, and the sides really aren’t sealed to the top at all. The four holes you can see in the top are the skewer holes, made all the way through the cake, that the recipe directs. After docking the top and brushing with egg wash, the cake is baked for three hours. Everyone I talked to thought that this was an extremely long time, and I have no idea if it really needed that much time, given how dry the filling was. The recipe only says “if a skewer comes out clean”; I would have liked a temperature reading I could set on my probe thermometer’s alarm. 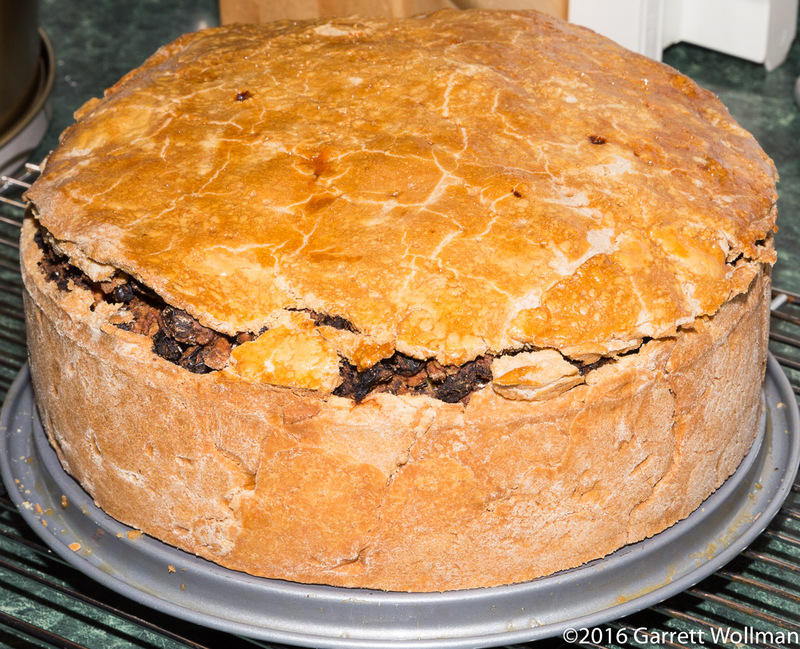 When the fruitcake did come out of the oven, finally, it was clear that it had expanded somewhat, and since the top wasn’t properly sealed to the sides, a gap opened up, pretty much all the way around. The cake has to cool completely before depanning, which took quite a long time — if I recall correctly, I left it to cool overnight, with another pan inverted over the top to keep dust off. After removing the side of the springform pan, the fully cooled (but far from mature) black bun is finally revealed. 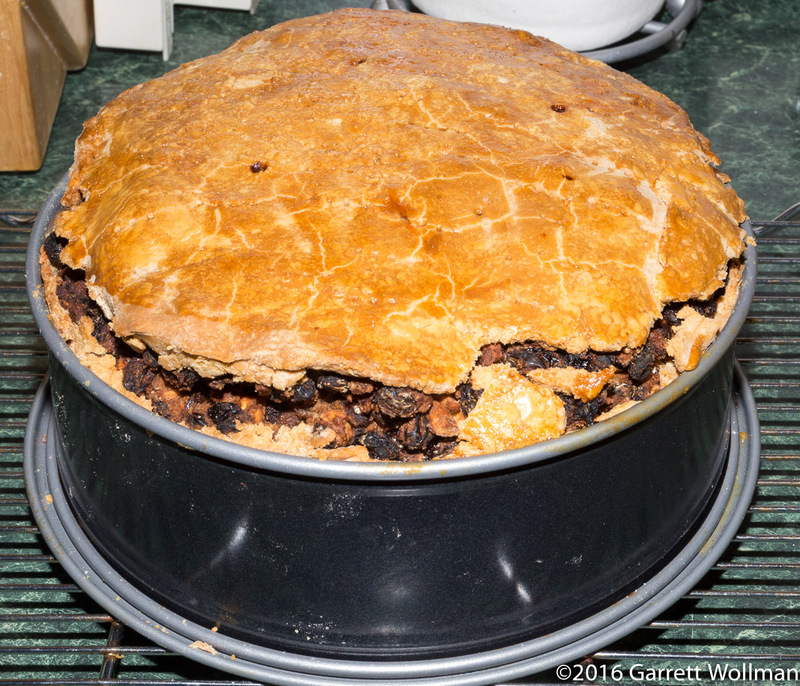 There’s nothing particularly black-looking about it, to be honest, except for where the filling has been exposed around the unsealed edge of the top crust. I wrapped the cake in foil as directed, and sealed it in a round cake tin for three weeks before bringing it into the office a week ago. Even with a serrated slicer, it was quite the challenge to actually cut this cake. The crust was comparatively little impediment compared with the body of the cake itself. I took a fairly large slice, most people couldn’t eat more than half or even a quarter of that, and even after making my usual rounds of the office, there was still about a quarter of it left over on Tuesday. 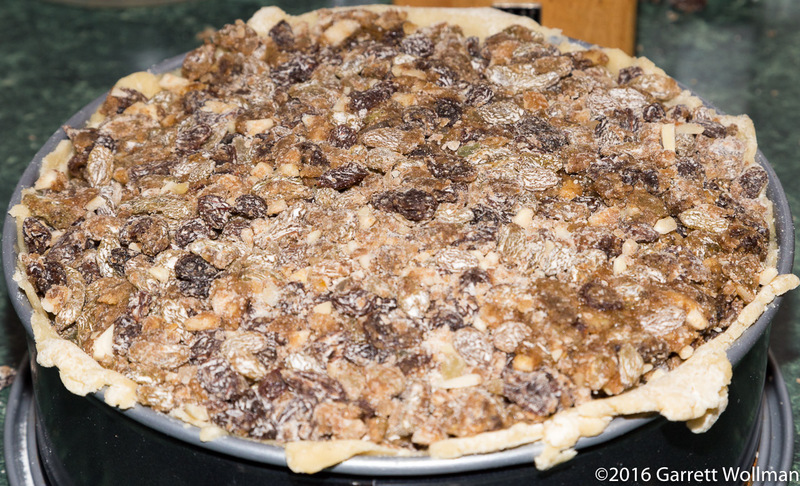 Gallery | This entry was posted in Food and tagged Diane Duane, fruitcake, holidays, raisins, recipe. Bookmark the permalink.